Echo Dot Failing to Drop the Bass? Build Your Own Gigantic Replacement! Privacy concerns aside, Amazon’s Alexa-equipped Echo Dot is a pretty nifty device. You can use it to answer questions, set appointments, play games, and even listen to music. Unfortunately, because of its small hockey puck-esque size, the sound quality of that music isn’t very good. Specifically, it’s lacking in the bass department. That’s no good for listening to your vintage dubstep collection, which is why you should follow JoeGadget’s tutorial and build the massive MegaDot. 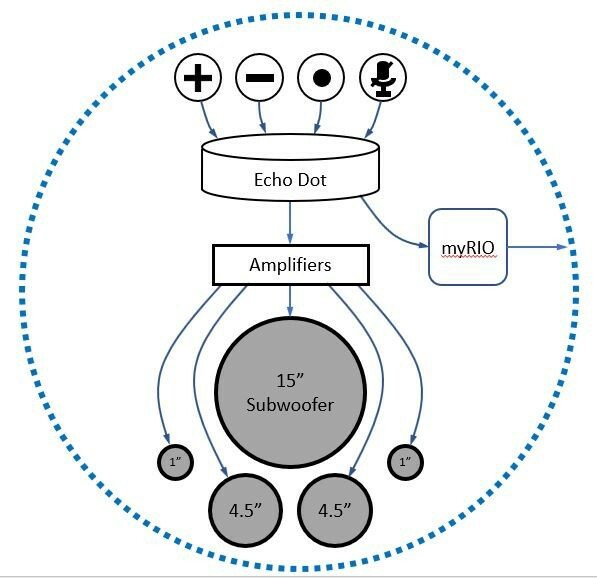 This is essentially an Echo Dot that has been scaled up to 8:1, with a real Echo Dot acting as the brains of the operation. It has a light ring and functional buttons like the original, and enough room inside for a thumpin’ 15″ 250W powered subwoofer and a set of smaller midrange and tweeter speakers. 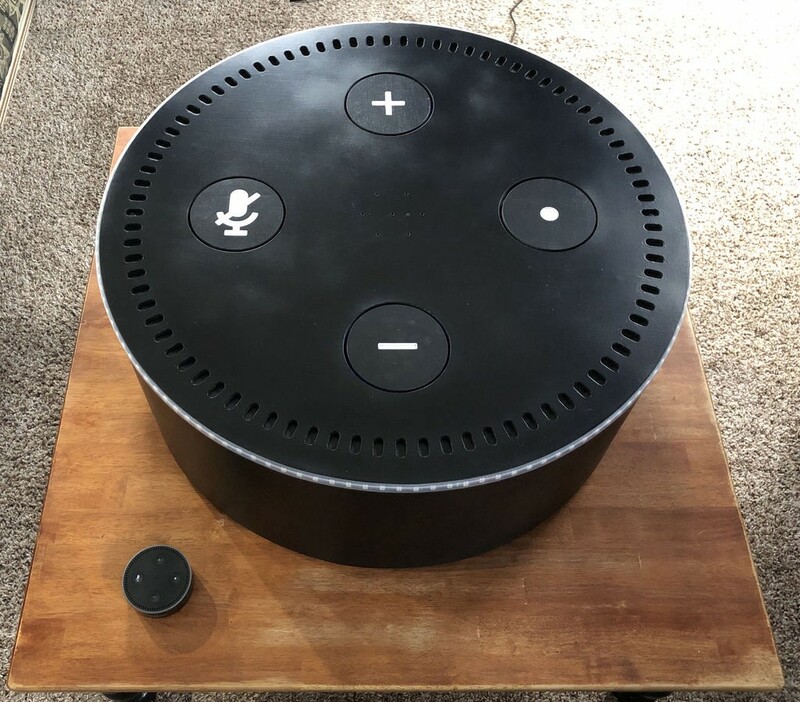 To replicate this project, you’ll need an Echo Dot with a warranty you’re willing to void, the speakers, a WS2812B LED strip, and a National Instruments MyRIO to control those LEDs. Following along with the tutorial, you’ll start by cracking open the Echo Dot to gain access to its delicate bits. Then, solder some very thin gauge wires to the buttons and the I2C signal pins for the LED ring. The Echo Dot’s buttons will be triggered with microswitches mounted to giant plywood buttons on the MegaDot, and the I2C signals will be intercepted to control the new WS2812B LED ring. To construct the enclosure you’ll need a 3D printer and some woodworking skill. JoeGadget used an X-CARVE CNC router to cut the plywood, but you may be able to do it with careful use of a handheld router. To form the cylindrical body, soak the plywood in water for about an hour and then bend it and clamp it in place. After painting, mount everything in place using hinges, screws, hot glue, and 3D-printed brackets. The finished product acts just like an Echo Dot, but has the bass to do Skrillex justice. Echo Dot Failing to Drop the Bass? Build Your Own Gigantic Replacement! was originally published in Hackster Blog on Medium, where people are continuing the conversation by highlighting and responding to this story. Original article: Echo Dot Failing to Drop the Bass? Build Your Own Gigantic Replacement!